A winter storm forecasted to hit Laguna Beach and the Southern California area this week packed a punch as promised, causing flooding in the Canyon and downtown areas especially on Thursday, Feb 14, resulting in myriad closures around the City. The warning said to expect intermittent periods of rain and potential localized flooding. During the storm, some homes were flooded and businesses had to close. On Thursday at 10:33 a.m., the Boys & Girls Club of Laguna Beach advised that the Canyon branch was closed due to flooding and that, “Top of the World, El Morro, and Thurston District Club members will be rerouted to the Lang Park Branch at 21540 Wesley Drive.” The Boys & Girls Club also strongly urged parents to pick up their children directly from school because of the severe weather. The warning swiftly changed, alerting that many areas in Laguna had been heavily impacted by flooding. The Canyon was closed between Canyon Acres and El Toro Road, as well as both directions of El Toro Road at the 73 Toll Road, and downtown at Broadway Street between Beach Street and Coast Highway. The closures remained in effect all day, anticipated to last until at least 5 p.m., according to Nixle. The storm channel collapsed between the Boys & Girls Club and the Sawdust, causing additional strife. The Susi Q Center opened its doors and was activated as a care and reception center/shelter for people in need and their pets because of safety concerns. At 3:45 p.m., City Digital Communications Coordinator Jennifer Chapman reported on Nextdoor: “The rain has largely finished for today. The forecast calls for light, scattered showers this evening. We may have additional rain showers on Sunday. All downtown streets are open again. Evacuations have been lifted for Sun Valley Road and all others evacuated from low-lying areas in Laguna Canyon, including clients of the Alternate Sleeping Location. Clients of the ASL are being transported back to the ASL from the Neighborhood Congregational Church. CalTrans crews are working remove debris to reopen Laguna Canyon Road. However, residents with proper identification may return to their homes. It wasn’t until 5:58 p.m. that Laguna Canyon Road was open in both directions. Stu News readers reported flooding and damage, but the exact amount is still unknown. The rain total in Laguna Beach has been 2.87 inches over the past two days and 3.03 inches over the past three days, according to OC Public Works. On Sunday, Feb 10, at 2:52 a.m., an LBPD officer was in the canyon near the dog park when she began to follow a possible DUI driver driving a 2014 BMW 535i outbound on Laguna Canyon Road. A DUI investigation was conducted and the driver was identified. Joseph Paul Digiulio, 23, of Newport Beach, was arrested on suspicion of DUI. The deluge of rain and high wind over the past few weeks has been a real downer for trees in Laguna Beach, literally, with reports of downed trees. Sadly, the saga continues with two more logged into the LBPD police logs. On Saturday, Feb 9, at 11:04 a.m., at the 700 block of Wilson Street, LBPD received a report referencing a tree falling on electrical wires. According to police records, the tree in the backyard had fallen into wires and the wires were hanging low. Edison was called. Later that same day, at 3:01 p.m., LBPD received a report in reference to a fallen tree biting the dust at the 600 block of Cliff Drive. According to police records, “the large tree fell onto the walkway, blocking the stairs.” No one was injured and LBPD called Public Works. According to police logs, a tree cutting service was enroute to cut the tree down. Public Works remained on scene until the service arrived. Looking ahead – it seems more rain is on its way, along with wind gusts as high as 25 mph on Wednesday, according to the National Weather Service. On Wednesday, Feb 6, at 4:21 p.m., LBPD received a report in reference to found property. According to police records, the RP found a diamond ring near the Naked Dog Bistro on Forest Avenue, also near Laguna Beach Animal Hospital. The RP was asked to fill out a finders’ affidavit. If you or someone you know lost their diamond ring by the Naked Dog, call LBPD’s non-emergency line at (949) 497-0701. On Tuesday, Feb 5, at 4:56 pm, LBPD officers responded to a suspicious item that washed up on Thalia Street Beach, at the 100 block of Thalia Street. The RP was advised not to handle it. OCSD Bomb Squad arrived a short time later and removed the canister for disposal. The sea marker was described to be silver and 18 inches in length, with “CCC” on the side, according to police reports. 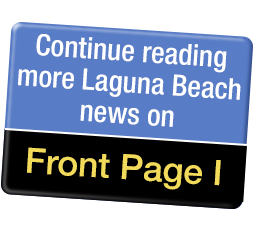 On Monday, Feb 4, at 4:43 p.m., LBPD officers were dispatched to the Laguna Beach Library parking lot, at the 300 block of Glenneyre Street, in reference to a battery investigation. Javier Hommy Blas, 32, of Laguna Beach, was located at Main Beach and taken into custody on domestic battery charges. According to Stu News Laguna records, Blas was previously arrested by LBPD on October 10, 2018 for allegedly carrying a concealed dirk or dagger, and on December 29, 2018 for possession of alcohol in a public place and obstructing/resisting arrest. On Monday, Feb 4, at 5:04 p.m., an LBPD officer was dispatched in response to a petty theft report in the 1000 block of South Coast Highway. “The victim stated that his Apple iPhone 8 was stolen from the laundromat. He stated that he had his Apple iPhone charging in a wall charger as he went outside to put laundry in his vehicle,” Sgt Cota said. According to the victim, he placed a magazine over the phone so it wouldn’t look obvious. He was away from the phone for less than one minute and then it was taken. The value of loss was approximately $600. The case will be submitted to detectives to see if any surveillance cameras recorded the theft. On Saturday, Feb 2, at 1:48 p.m., LBPD officers responded to 3rd Ave and S Coast Hwy for a battery that had allegedly just occurred involving a city trolley driver. The suspect was described as having a black moustache and beard, and wearing a black hoodie pulled over his face and black pants. Officers searched the area but did not locate the suspect initially. The suspect, Michael Granados, was later located in the Gelson’s Shopping Center at Monarch Bay Plaza. Granados was brought to the station, but he remained uncooperative according to Sgt Cota, and was taken directly to OC Jail. “He was transferred from a police unit to a jail van but he was able to spit again, which struck a jail supervisor on the forearm,” Sgt Cota said. On Tuesday, Jan 29, at 12:45 p.m., LBPD and LBFD responded to the alley behind 730 N Coast Hwy for a report of an injury collision. Chief Weinert added that this was a freak accident that could have happened to anybody. According to Cassie Walder, City Community Information Officer, the tree was ultimately removed on Wednesday, Jan 30, due to poor health. “The tree had been declining for some time and it was likely due to [the] combination of the drought stress, extreme compaction of the soil around the root zone, repeated topping of the canopy by SDG&E to keep it out of electric wires and potentially some root disturbance due to maintenance of adjacent pavement, mailbox, pole and retaining wall,” said Shohreh Dupuis, Assistant City Manager/Director of Public Works. The tree was a Red Flowering Eucalyptus. All Orange County first responder dispatch centers will begin accepting texts to 9-1-1 on February 6. Text-to-911 is the ability to send a text message to reach 9-1-1 emergency call takers from your mobile phone or device. This service is aimed to assist people who are hearing impaired, or speech disabled, or someone who is in an emergency situation where calling 9-1-1 is not possible. Always contact 9-1-1 by making a voice call if you can. On Sunday, Jan 27, at 3:22 p.m., an LBPD officer initiated a vehicle enforcement stop in the area of Cardinal Dr and S Coast Hwy. The driver was identified as Orange resident Athanasios Anagnostos, 47. A records check revealed he had an outstanding warrant. He was subsequently taken into custody. According to multiple web sources, the average cost of heroin is $15-20 for a single dose (0.1g). 19 grams would be valued at between $2,850 and $3,800. Bail was set at $55,100. On Tuesday, Jan 29, at 4:07 p.m., LBPD officers were dispatched to the 20600 block of Laguna Canyon Rd. The call was in reference to a male allegedly inside a vehicle pointing a rifle toward the hillside. Detectives requested drone response. The drone and detectives surveilled the occupied vehicle. “The male was observed possibly smoking methamphetamine. He noticed the drone, flipped it off, and drove away from the area towards El Toro Road. Officers stopped the vehicle near Greenfield Drive in Laguna Niguel,” Sgt Cota said. Last week in Animal Files, Stu News reported that a turtle had been found by Animal Services and was being cared for with the hope that its owner would read about it and find their wayward pet. Good news…the turtle was reunited with its owner on Saturday, Jan 26, eight days after the turtle’s traveling trek began, after reading our story. To reiterate the turtle trials, LBPD received a report on Monday, Jan 21 about a large turtle found on Friday, Jan 18, at 31600 Scenic Dr.
Now the turtle is reported to be safe and sound with its family. On Saturday, Jan 26, at 2:38 p.m., LBPD officers responded with LBFD to a traffic collision at Mountain Rd and S Coast Hwy. They arrived to the scene and found three vehicles involved but no injuries reported. David Alan Gilmore, 30, of Santa Ana, was arrested on suspicion of DUI, possession of methamphetamine, and possession of unlawful paraphernalia. On Saturday, Jan 26, at 9:36 p.m., at S Coast Hwy and Vista del Sol, a woman called dispatchers to report that her Lyft driver was “out of his mind.” According to LBPD records, dispatchers could hear the driver yelling at the female to get out of the car. An officer responded to find the RP had left. A vandalism report was taken and additional follow up will be needed by detectives. On Thursday, Jan 24, at 12:33 pm, LBPD officers responded to a possible robbery that had just occurred in the area of Thalia St and S Coast Hwy. The alleged victim said that his friend hit him with a skateboard and took his wallet, which contained $100. They reportedly used to be friends. Once on scene, officers were able to gather a bit more information and learned the direction of travel and where the suspect likes to hang out. The suspect was located in the 100 block of Brooks St. The suspect was described to be a white male in his 20s wearing a grey sweatshirt and skinny grey shorts. On Sunday, Jan 20, at 2:06 p.m., an elderly resident came to the LBPD station to report that her wallet was stolen while shopping at Gelson’s, at the 30900 block of S Coast Hwy. “She was approached by a male in the bread aisle. The male distracted her and asked her random questions about different bread types while another person removed her wallet from her purse. The victim’s credit cards were used at unknown locations,” LBPD Spokesperson PIO Sgt Jim Cota said. The victim is working with LBPD and will provide banking statements with further information. Her credit cards had already been used twice by the suspect by the time she reported the crime. The loss was estimated to be around $6,000. On Monday, Jan 21, at 12:09 p.m., LBPD received a report about a large turtle found on Friday, Jan 18, at 31600 Scenic Drive. If you or anyone you know recognizes this trooper of a turtle, call Laguna Beach Animal Shelter at (949) 497-3552 or go to 20612 Laguna Canyon Rd. The suspicious person was described as a male with a baseball cap and a hoodie pulled over his head. The odd occurrence lasted for about 30 minutes and then he reportedly went back in the bus. The reporting person had to leave to take their children to school but wanted LBPD to check out the situation. LBPD went to the location, however, no one was in the bus and the suspect could not be found. Interestingly, the retro ride had a vanity plate. Trees have been blowing into police reports since the heavy rains hit. Last week two more incidents were reported to LBPD. On Wednesday, Jan 16 at 8 p.m., at the 2400 block of Juanita Way, LBPD received a report in reference to two trees that had fallen in the street. The reporting person alerted LBPD after she heard the information from her neighbor. She did not see it herself, so the information was considered secondhand. According to police records, “Two trees down in the street, one a large tree approximately 20 feet tall.” LBPD contacted Public Works who removed the trees clearing the roadway. A couple hours later the street was open. According to police records, the tree was blocking the street and the RP said he had to “drive through the tree.” Public Works went to the scene and said there was no road obstruction. The tree, which was noted to be a private tree, had been cut up and put on the side of the slope. According to the report, the caller was just giving LBPD a heads up. “The RP just wanted us to be aware,” the report states. The California Department of Fish and Wildlife (CDFW) and Orange County Parks just completed a massive cleanup of a black market marijuana grow discovered late last year at Laguna Coast Wilderness Park, according to a release issued by CDFW. The black market marijuana grow was discovered on September 27, 2018 by CDFW during routine flights over Orange County with the National Guard’s Counter Drug Unit. Following the discovery, Newport Beach Police Department conducted an eradication mission at the site. Attempts to apprehend the suspects were unsuccessful. According to CDFW, officers eradicated 500 plants and confiscated 75 pounds of processed marijuana. The grow, when in full production, contained almost 1,500 plants. During the eradication, CDFW documented numerous environmental violations including streambed alterations, haphazard pesticides left on the property, trash within 150 feet of a waterway, and a poached deer. According to Laguna Canyon Foundation Executive Director Hallie Jones, the grow area was well-hidden in a remote part of the 7,000 acre park, and caused significant habitat damage to our endangered coastal sage scrub habitat. “Growers remove native plants and cause additional damage by creating trails and using chemicals on the marijuana plants. This grow site will require extensive repair and mitigation to restore the destroyed habitat,” said Jones in a statement to Stu News on Thursday. “Passive restoration, in which we remove the problem and let the plants re-establish themselves, will take years. The rains this winter will help, and within a few years we should be hard-pressed to identify exact sites,” Jones continued. The team cleanup effort was conducted in two phases, in December and January, and included the removal of approximately 3,120 pounds of trash, 1,500 feet of plastic irrigation piping, 24 ounces of pesticides as well as other forms of garbage that can be detrimental to the environment. For the cleanup, OC Parks worked with a specialized hazmat contractor, Clean Harbors, to ensure the pesticide was removed and disposed of correctly. Through testing, the pesticide was confirmed to be carbofuran, a highly toxic and banned substance. To understand the toxicity, just a teaspoon can kill a 300-pound black bear. Between 2013 and 2018, CDFW has removed more than 2.4 million feet of irrigation pipe, 50 tons of fertilizer and 65 gallons of chemicals, many illegal in the U.S., on black market grows. CDFW has also removed 709 dams and water diversions resulting in restoration of 800 million gallons of water back into local watersheds.